Beautiful set of 3 handcrafted sconces by Palwa, circa 1960 featuring hundreds of gilt brass rings encrusted with crystal glass. Excellent condition, restored and newly rewired, two bulbs with 40 W per light. We have a total of 3 available, sold and priced per piece. 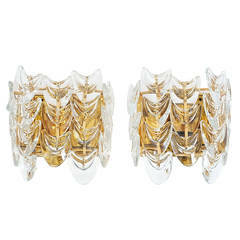 Pair crystal and gilt brass floral motif wall sconces by Palwa, Germany. Each sconces uses single candelabra base bulb. Newly wired with newer backplate for US installation. 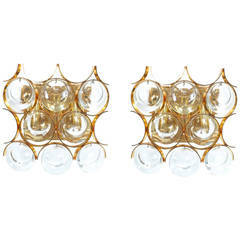 Pair of Palwa wall sconces crystal glass and gilded brass, Germany 1960s. Very good condition.